Conditions were great, it was a four-hour flight, I could skip Lovelock. It’s called a ghetto heater. A small electric or ceramic space heater, one you might normally see under a desk in an office warming a large woman’s feet, with a piece of aluminum ducting running from it into the cowling. I use thick blankets to keep the heat from escaping, tucking the blanket around the ducting in the cowling and laying the rest over the engine. I am not sure why I decided to build a ghetto heater to keep the engine temperature from getting too cold; I know they make several nice engine heaters that are far less work to attach and probably do a better job. I never could understand fully the things I choose to rebel against and the things I do not. I digress… I put the ghetto heater on the airplane the night before our flight. It’s finally Spring here in the mountains, so I most likely did not need to use the heater, but I had some passengers (four) and I knew I would feel a little less stressed if I did every little thing I could to ensure an event-less flight. I reached under the blanket and I rubbed up and down the sky blue cowling, “We got a trip tomorrow Martin, you’re gonna do just fine.” I turned and I left the hangar, glancing one last time behind me to the airplane as I left. I did all the work on paper several days prior, and again the night before, but I enjoy being a good pilot. It’s part of the satisfaction of the whole experience for me, so I do it all, again, and again, and again, till the whole thing is over. “Stop” written in red on the plastic button next to the door gets mashed with my thumb, then the black button “Open” and then squeak of the hangar door rolling open. I’m the only one there that morning. I love that. Martin looks weird with blankets all over his nose and that ghetto heater sitting on a table under the prop with the heater on it, but I know he’s warm. The smell of fuel from draining the sumps, the long run of my hands along the rivets on the fuselage, a few tweaks of a control surface and I’m pulling the airplane out of the hangar, leaning back at about a 45-degree angle on the red towbar attached to his nose. Door shuts, handle locks, and I pop the window open to shout “clear prop” to absolutely no one. He starts up like he was brand new. “Sputter, sputter, choke sputter,” he says after the primer fuel burns off and I pull the throttle all the way back. He’s starving for fuel, but I let him for a few seconds while I check the oil pressure to make sure it’s rising into the green. Then I give him what he wants with a few clockwise twists, to bring him to 900 rpm and let him hang a bit while the whole of the engine gets warmer. I love this airplane. A 1965 182H Skylane, sky blue and white with bright red wingtips and red stripe right down the sides. When I first saw him, I was a little taken back by the paint… I can’t say I was born keen on the whole baby blue anything. But when I see him now, sitting out at some airport under a desert mountain along a dirt strip, he makes my heart skip a beat. I think he’s beautiful. I’ve become fascinated by the distinct relationship that forms between a pilot and the aircraft that pilot flies. I first heard of it from Jim Hoddenbach when I was being introduced to aviation. He said that some pilots “imbue their aircraft with a sort of soul.” I thought that was terribly romantic sounding, so I naturally assumed I knew what he was talking about instantly. Of course, I didn’t and I wouldn’t truly understand it for a couple years. None the less, I went on repeating that sentiment as if I did until it got to the point that the phrase lost meaning to me, as was lost in the myriad of other things we do to make ourselves sound like we know things. It wasn’t until I had a truly terrifying flight that it began to happen. 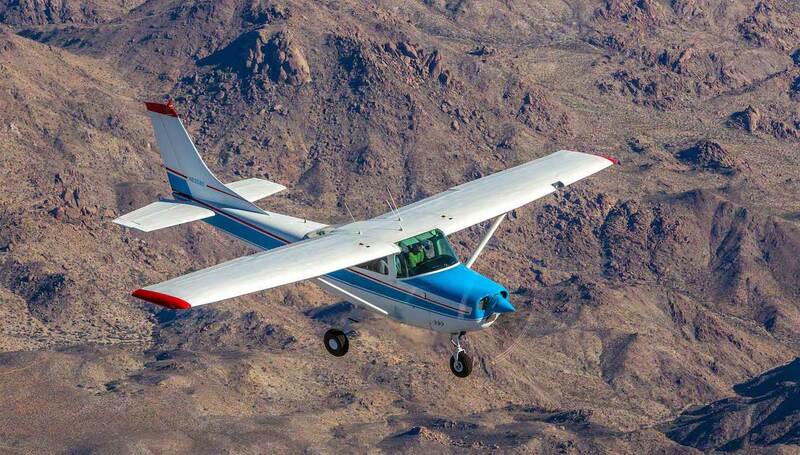 Back then, I was flying a 1977 Cessna 172N and I had done so only in the province of the small airport I had learned in. I had not ventured very far away at all and my cross-country solo was a year prior. It was time, though, time to take the airplane to Truckee California where I had recently moved and I was deathly afraid of such a thing. What I knew of Truckee, hell, what I knew of northern Nevada, was that in the afternoons the winds were a nightmare and Truckee is a very wealthy area where the attitude can be a bit “snarky” let’s say. One of the things I loved, and still love, is the small airport where a man’s paint job isn’t the sole indicator of his virtues as a pilot nor the quality of his aircraft, and at that time I was under the solid impression that I was gonna be embarrassed not only by my lack of skills flying into an airport with the oddest noise abatement adjusted pattern but by the fact that my airplane (Stacy) had some “city miles on her.” She’s been neglected in a parking lot, left out in the sun for five years and run ragged before that! 19,000 hours on the airframe, a patch on the spinner, and on, and on. I tell ya, I wasn’t convinced this airplane was gonna stay afloat for short trips around Bountiful, let alone a 600-mile cross-country trip in the hands of an amateur headed into snoot-ville California! I had a passenger with me too. A young woman whom I care greatly about and I… Well I just did not want to do this. I set some rules, though: I made it clear to all that I was not leaving the ground unless all my rules were met to the iota. We were leaving at 8:00 am sharp (it was winter and that’s when the sky was lit up.) We were taking nearly zero pounds in weight and landing three times, once in Elko, once in Lovelock, and then, of course, Truckee. Nothing was acceptable outside of those bounds because I would NOT go all the way to Truckee if it meant I was landing in winds over 15 knots. That morning, my ride to the airport was late, there was frost on the wings, and the FBO had not filled the airplane up and pulled it into the heated hangar like requested. It was 11:00 am when I left the Salt Lake area. The thing is that the more I kicked against not going the more I was faced with the fact that I knew I could make the flight. Conditions were great, it was a four-hour flight, I could skip Lovelock, and I was being a giant wuss. I did the math over and over and adjusted my flight plan over and over but I could not get it to say anything other that: it’s okay to go. So away we went, a terrified pilot, one female passenger (whom I had terrified by this point), and an old airplane and only 20 pounds of luggage. The flight was uneventful, the winds at Truckee were terrible (8 – 20 gusting across the runway) and I ignored the noise abatement and flew a standard pattern right down onto runway 29. When it was over, I became a pilot. I may have been licensed before but not until then did I catch the “disease.” And after that one flight, after that terrible and wonderful, uneventful everything was I in love with my airplane. I think about that every time I feel guilt over not visiting Martin (the 182) for a period of time or when I rub his nose and say a few words to him before I leave the hangar for the night. It makes sense to me. In wartime, men bond that fight battles together, bonds that last a lifetime and concur distance and age. A pilot, at least in my mind, battles with his airplane in the skies, not against, but with. They survive together; they get each other home. It’s because of this curiosity that I have begun making a documentary about this bond, about the infusing of a soul into an airplane by its pilot. I think I’m gonna call it “Marrow Deep”.